The start of the year was particularly difficult for me. I had left hospital however was still waiting to hear whether I was needing revision surgery. The NHS were refusing to give me a prosthetic leg and I was being sent around the hospital network of surgeons to find someone to perform the revision surgery. To get my mind off of things, I went to Morocco with my best friend Elliott, where I found that I was able to swim after years fearing the water because of my foot. Also in January, I started working with the Knights Foundation - a charity based in Surrey/Hampshire/Berkshire, who help to support disabled children, families and young carers. In the following months, I spent a lot of time representing them at various events and school visits. My birthday month! With the need for surgery identified, but without a surgeon to perform the operation, I started looking for a full-time job. I started to research companies and various positions, while I searched for that perfect fit. I visited Italy for a few days and was beginning to really struggle with my lack of mobility in my chair. I was not in any pain however was limited physically with my wheelchair and the cobbled streets of Florence were extremely frustrating. After returning from Italy, I was determined to start walking and gain some more independence. I really started chasing surgeons and hospitals, to try and find out when my surgery would be. My first meeting with Blatchfords! Also at this time, I started filming for the Employable Me series and visited London on multiple occasions, to be part of various workshops in order to aid my job search. I was also presented with my Gold Duke of Edinburgh award at St James' Palace as well as spending a weekend volunteering with kids and climbing Mount Snowdon in Wales on my iWalk. I started off the month with a fundraising day with Metro Bank in Basingstoke, raising money for the Knights Foundation. I was still very frustrated with the NHS's lack of prosthetic support so I purchased a leg from Blatchfords. I had my first casting for my leg and was fitted with it, just a few weeks later, in the beginning of May. Also in April, before receiving my prosthetic, I completed the first Tough Mudder of the season - London West! This is really when my year started to get going! Not only did I receive my prosthetic leg, I also flew to Spain and completed just under 200 miles of the Camino de Santiago in my Mountain Trike wheelchair. I had such an incredible experience (see previous blogs for more information) and will hopefully be going out again in 2018 to do it all over again! After returning from Spain, I started my full-time position at a company in Basingstoke. As I couldn't use my leg in Spain, this is when I first started really using my prosthetic. 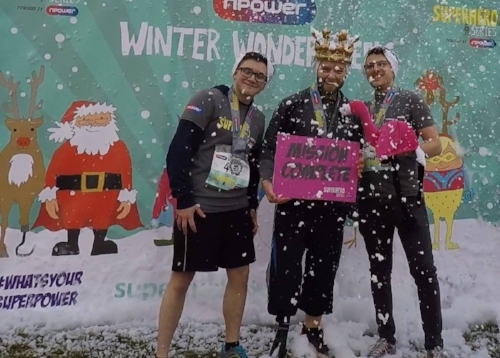 I travelled to Henley-on-Thames, as well as Scotland to complete more Tough Mudder courses on my iWalk and attended Limb Power's multi-sport event. At this event, I met sporty-type amputees for the first time and I was so excited to be up and running, like the other people there. Towards the end of June, I also started officially volunteering at the Army Cadet Force and was issued my uniform. A crazy month! From flying Dubai to Germany the following week, July also saw me volunteer with more kids as well as receive my Blade XT running blade. I ran without pain for the first time in 14 years and pushed a chap round a Tough Mudder course in my Mountain Trike wheelchair. Definitely the best month of my life! I was able to take a week off of work and I travelled to Turkey, to enjoy a holiday with my Dad. The day after returning from Turkey, I ran the Mudnificent 7 series near Coventry. Later in the month, I completed the Tough Mudder South West events and competed, and won a silver medal, in the British Judo Special Needs Championships, as the only lower-limb amputee. Towards the start of the month, I ran the Wolf Run, the Parallel series, had my pre-operative assessment and completed 2 Tough Mudder courses, just in the first 2 weeks. In the second half of the month, I completed the tougher wave of the London South Tough Mudder course dressed as a pirate (because....why not)! On the 19th, I had my revision surgery (in two different stages) and subsequently spent a week in hospital recovering. Still recovering from surgery, I tried my best to stay away from the gym and I suddenly became very good at the playstation! I was allowed to return to fitness after 3 weeks and 4 weeks after surgery, I was allowed to have a casting for my prosthetic leg. I also had a great time completing the Great South Run in my wheelchair. I received my prosthetic leg just 6 weeks post-surgery and started walking again. After quite a few different tweaks, I was up and walking again. I furthered my Army Cadet training, attended a camp and was casted for my prosthetic! I was given the sign-off to start hopping and returned to judo (eventually). After returning to Judo on the Monday, I then popped over to Holland to compete at the Dutch competition series, where I achieved a silver medal against those without physical disabilities. The second series of Employable Me Series 2 also started and it was great to see little snippets of me on TV in December. I ran/walked the Winter Wonderwheels event for Blatchfords - which was pretty awesome! A few weeks later, I was officially given the sign-off to start running so I ran my first ever Parkrun. I've had a lot to eat this December and I've still got Christmas to go yet! This year has been pretty crazy, incredible, scary, amazing and just.....well I'm quite stumped for any more adjectives. I had a really difficult start to the year and I go into 2018 with great confidence for my sport and life in general. It's mad to think that before May, I had not walked without pain for 13 years. Since receiving my prosthetic, I have run/walked 190 miles in just events, not including training and my 200 mile trek through Spain in my wheelchair. Next year, I anticipate running at least 430 miles (ouch)- and that's just the events that I have planned at the moment. Thank you so much for your support this year and I anticipate 2018 to be a much better year (if that's possible). I certainly know that my 2017 year would not have been possible without the support of Blatchfords with my Blade XT. It has given me the freedom to inspire others, as well as accomplish things that I would have never thought would be possible. Perhaps the choice for me to amputate was right? I'm free, i'm happy and i'm loving life - what more could I ask for? Disabled - A Label or an Identity?